I am about to take a flight on an airplane. 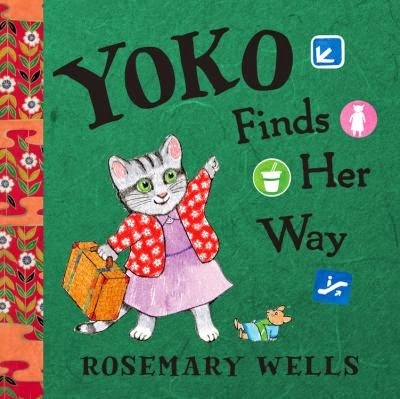 It is good that I have read Yoko Finds Her Way by Rosemary Wells. Yoko teaches readers young and old how to watch for directional signs that help them get to the airport, through checkin and customs, and to the gate for their flights. With good signs, it might be easy to navigate through the big airport, but Yoko goes through one wrong door. Getting back to her mother is a little adventure. We have been reading Rosemary Wells books in our house since my daughter was little. Our daughter has graduated from college and is living her own life in another state now, but Bonnie and I still like to bring home the author's brightly illustrated books. I particularly enjoy the oriental touches in Yoko Finds Her Way. It is also good to know that there will be food at the airport. Wells, Rosemary. Yoko Finds Her Way. Disney Hyperion Books, 2014. ISBN 9781423165125. Do not use when referring to East Asian nations and their peoples. Asian is the acceptable term for an inhabitant of those regions. Oriental rug is standard. See nationalities and races and race"
"Oriental" is a very vague term and I could have chosen better. The Middle East is at times referred to as the Orient. The illustrations have a particularly Japanese flavor.